First teaser for Guy Moshe's BUNRAKU starring Josh Hartnett & Woody Harrelson! Admittedly a 30 second clip that only features about 5 seconds of actual movie footage isn't exactly what I was expecting for the first clip from Guy Moshe's Bunraku (review) but when it comes to a film I've been looking forward to since it was first announced (and judging from the number of posts we've had on the subject, I'm not the only one looking forward to it) and from which we've only seen a few images, this is indeed something to get excited about. A mysterious drifter (Josh Hartnett) and an ardent young Japanese warrior Yoshi (Gackt) both arrive in a town that is terrorized by outrageous and virulent criminals. Each is obsessed with his separate mission, and guided by the wisdom of The Bartender (Woody Harrelson) at the Horseless Horseman Saloon, the two eventually join forces to bring down the corrupt and contemptuous reign of Nicola (Ron Perlman), the awesomely evil "woodcutter" and his lady Alexandra (Demi Moore), a femme fatale with a secret past. This classic tale is re-vitalized and re-imagined in an entirely fresh visual context, set in a unique world that mixes skewed reality with shadow-play fantasy, a place where even the landscape can betray you. Heroes triumph here only because the force of their will transforms and transcends both space and time. The world of BUNRAKU is past and present, fantasy and reality, Samurai and Western all combined. Like "Sin City" and "300", it gives classic conflict a whole new graphically supercharged dynamic. 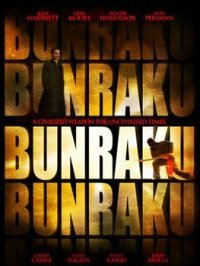 Resonating through a wide range of cultures and showcasing a mind-blowing array of martial arts disciplines, BUNRAKU is a fresh arena for breath-taking fight action. OMG that looks awesome! I can't wait. I swear I gonna kill someone if the film is not released soon! I can't wait to see this either! However the trailer can be much much better. The trailer doesn't sale the film! OMGACKT!! i will die waiting!